From left to right: The Wolak Group Event Coordinator Cara Campanie; The Wolak Group Director of Operations Greg Constantino; Dunkin’ Integrated Marketing Manager Eric Stensland; Dunkin’ mascot Sprinkles; The Wolak Group Chief of Staff Bob Alberti; Dunkin’ Franchisee Tom Santurri; and Dunkin’ Franchisee Santina Christian. 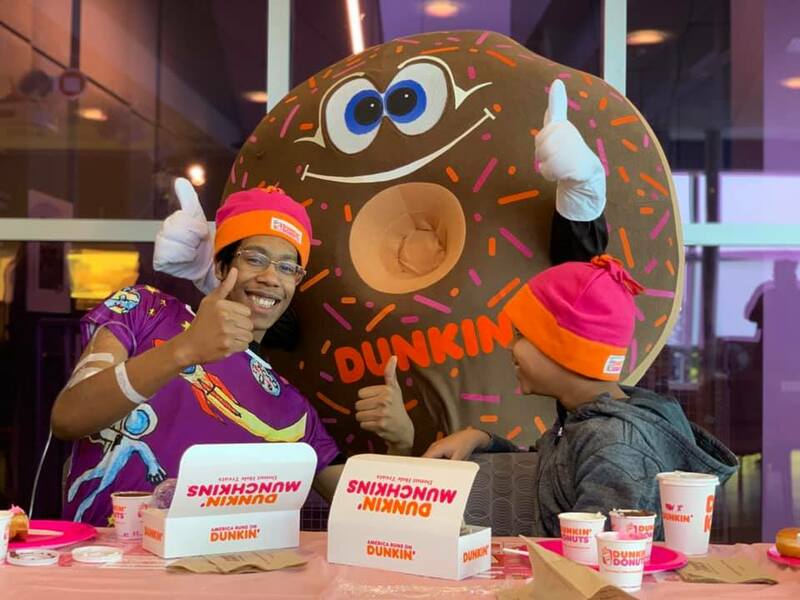 SYRACUSE, NEW YORK; –The Joy in Childhood Foundation, the charitable foundation supported by the Dunkin’ and Baskin-Robbins brands, today announced that it will host a Day of Joy for pediatric patients at the Upstate Golisano Children’s Hospital. This “Day of Joy” is a designated day when the Joy in Childhood Foundation celebrates its support to organizations that share its mission to provide the simple joys of childhood to kids battling hunger or illness through special events and activities in local communities. The Day of Joy will include a special delivery of custom Starlight Gowns designed by the Joy in Childhood Foundation that feature fun and colorful depictions of outer space, the underwater world and a rainbow. This is the second year of the Joy in Childhood Foundation’s three-year, $1.5 million commitment to Starlight Children’s Foundation, which includes support of the Starlight Gown program and provides kids in hospitals with high-quality, comfortable and brightly-colored hospital gowns to wear while undergoing treatment. 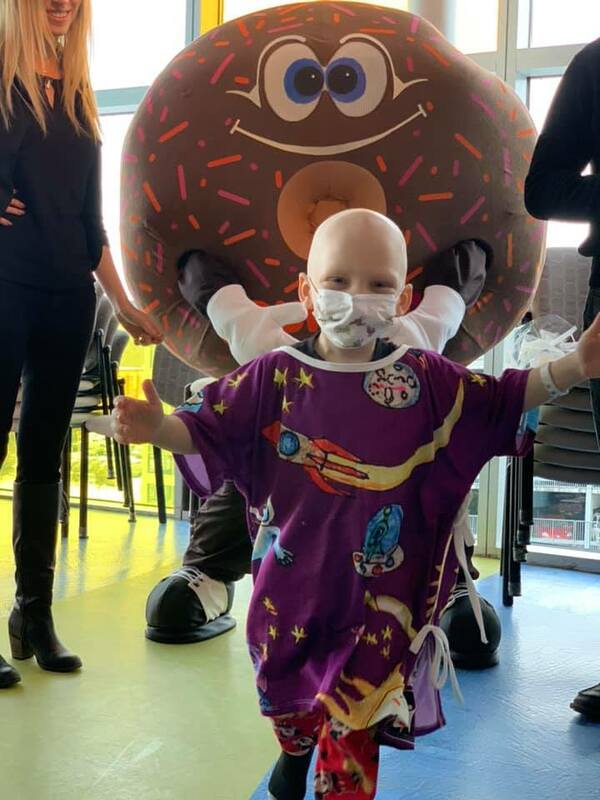 In addition to delivering the Starlight Gowns, Central New York Dunkin’ franchisees also provided a donut decorating activity for the pediatric patients at Update Golisano Children’s Hospital. 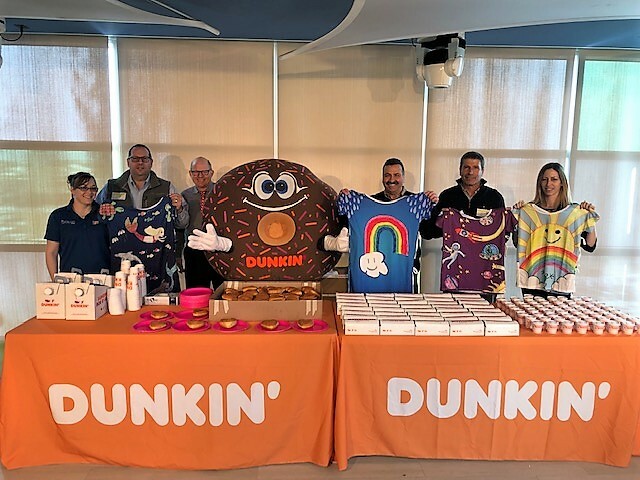 The local franchisees also provided two staff members at Upstate Golisano Children’s Hospital with special donut bouquets as a thank you for all they do for the children. Since 2017, the Joy in Childhood Foundation has delivered nearly 25,000 Starlight Gowns to children’s hospitals nationwide. The Joy in Childhood Foundation is a 501(c)3 not-for-profit organization, powered by Dunkin’ and Baskin-Robbins. The Foundation’s goal is to provide the simple joys of childhood to kids battling hunger or illness. The Foundation brings together a wide range of stakeholders — including franchisees, crew members, employees, partners and guests — and partners with food banks, children’s hospitals, and nonprofit organizations directly committed to serving kids to fund joyful environments and joyful experiences for kids when they need it most. Since launching in 2006, the Joy in Childhood Foundation has granted more than $18 million to hundreds of national and local charities across the country. For more information, please visit www.joyinchildhoodfoundation.org. Starlight’s mission is to brighten the lives of seriously ill children and their families by turning pain, fear and stress into laughter, fun and joy – because a sick kid is still a kid at heart. Founded in 1982 by Peter Samuelson and Emma Samms, Starlight has helped more than 60 million critically, chronically and terminally ill or injured children in the US, Canada, Australia and the UK by providing programs that offer the best in entertainment, education and one-of-a-kind experiences. Steven Spielberg serves as the organization’s Chairman Emeritus. Learn more at www.starlight.org and follow Starlight on Facebook, Instagram and Twitter. Upstate Golisano Children’s Hospital opened in 2009, with the mission to provide safe, effective, innovative and family-centered care for children in the Central New York region. Upstate Golisano serves children and families across 17 counties and treats over 100,000 pediatric encounters per year. As the region’s only level-1 trauma and burn center, Upstate offers a complete range of health care services for children from birth to 19 years of age. Upstate Golisano’s dedicated pediatric providers and staff care for patients in general pediatrics, pediatric surgery, hematology/oncology, the only pediatric intensive care unit in Upstate’s referral area, and the only dedicated pediatric emergency department between Rochester and Vermont. Upstate Golisano Children’s Hospital offers a full spectrum of ambulatory services including primary care and several nationally-recognized specialty patient care programs.